"Just to let you know I have found your course REALLY thought provoking." "Thanks so much for creating this awesome 5 day Challenge! It has made me look at things so much better. I have been doing this for 5 years and I feel like I never can figure out. I knew this year I really needed to change it up!" "I am brand new at doing Craft Sales. I started in November 2017. Did my first sale sold nothing. Did my second sale and sold a couple of items Took the 5 day challenge and made a profit at the last sale." "Wow I am loving your emails... Written in a clear and simple way. For all your help given so far I can't thank you enough"
"This has been a complete eye opener for me so thank you very very much for all of the amazing tips that you have shared. I have decided to start my stall from scratch and build in all of your advice and I can't wait for my next event." Since I launched the challenge a few months ago, thousands of handmade business owners have joined and learned the little tricks that add up to big results. 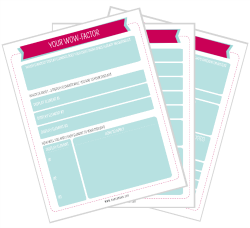 Get FREE worksheets when you join! A big one is knowing there isn't one product that sells best or creates the most popular display at a craft show. Any vendor can have a best selling booth and shoppers stopping by all day. Create a "need to have" for your product instead of a "would like to have but I'll just take a business card for now"